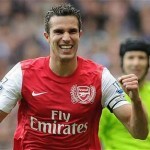 Roberto Mancini doesn’t expect Robin van Persie to join Manchester City. The Holland international is in the final 12 months of his contract at Arsenal, and following his sensational form of last term, he was always going to be hot property the moment he revealed he would not be penning an extension. City, who have raided the Gunners on a number of occasions in recent years, were quickly installed as frontrunners for his signature. However, coach Mancini has all but conceded defeat in his quest to land the 29-year-old striker, after revealing he doesn’t expect to be welcoming the player at the Etihad Stadium before the 31 August transfer deadline. “Van Persie? No, I don't think he will come here,” the Blues coach is quoted as saying. It has been a frustrating summer so far for the champions, who have been unable to add to their already hugely talented squad. This frustration will likely increase further should van Persie join neighbours and title rivals United, who are now favourites to land the former Feyenoord hitman.